We LOVE fall! One of our favorite fall traditions is decorating the house for fall. 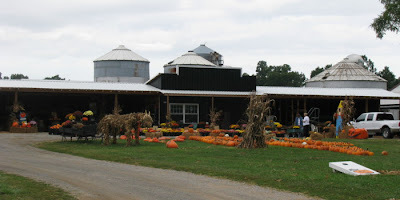 We love going to a local farm to gather up things for a fall display we put in front of the house every year. This year, our neighbors across the street were so nice and gave us pumpkins that their father/father-in-law grew. This weekend, we went to Wooden Farm. 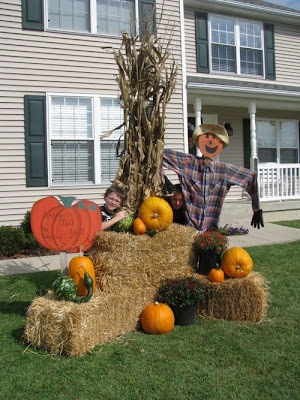 The boys had fun playing corn hole, going through their straw maze and becoming part of the fall decorations! I had too much fun looking through their selections of interesting pumpkins, goards, mums and other decorations. I picked out some mums and goards for the front yard display and several mini pumpkins and goards and indian corn for inside decorations. I had my guys to help me get it all loaded up. 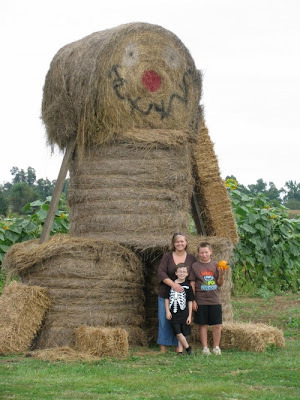 We couldn't leave without posing with the HUGE round-bale scarecrow out by their entrance! Our next stop was to visit my parents. 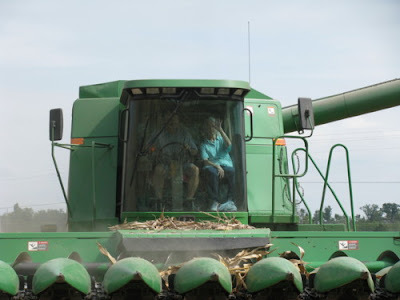 Dad was harvesting corn on the farm where I grew up. We were surprised to get there to see my grandmother waiting in the truck with Mom. 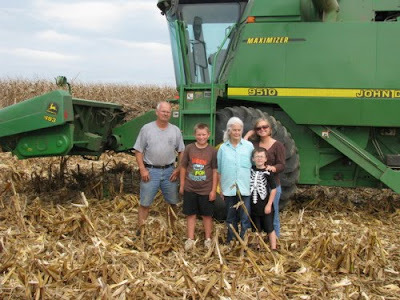 I had never realized that Grandma had never been in a combine before! It was fun seeing her on her first ride! She enjoyed it. Dad said she needs to come back when it's time to run soybeans. 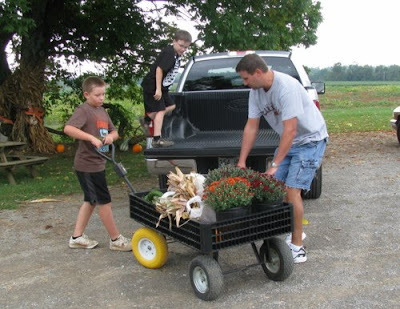 While Grandma was riding with Dad, my boys were helping Tom gather up corn stalks for our fall display. Later, they had their turn in the combine, too. Before heading home from the farm, we also picked up some straw bales. 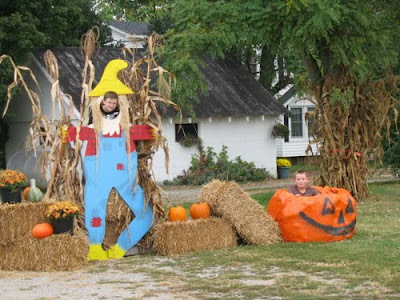 When we got home, I pulled out our "Happy Fall Y'all" pumpkin and the scarecrow I made with my Pappa a few years ago. It's extra special to me since the scarecrow wears one of Pappa's shirts and his hat, too. With a little arranging, our fall display in the front yard is complete! Our "fall" activity for today involved a real fall. Kevin attended a birthday party at a gym and fell coming off an inflatable. We ended up spending four hours in the ER tonight. He has a concussion. We had a very scary couple hours with him unable to remember many events, repeating himself, and not understanding. 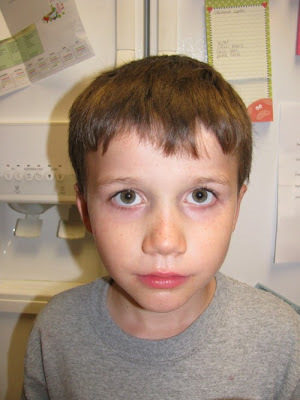 He was also dizzy, had trouble walking and vomiting. We were happy to hear that the scans had been thoroughly reviewed and did not show any bleeds. After taking a long nap in the ER, OUR Kevin was back, alert, and talking to us like normal. We are happy to be home now! Happy Fall Y'all - the seasonal kind, that is! I LOVE your fall display! You are so good to decorate like that. So sorry to hear about Kevin! How scary! I hope he sleeps well tonight and feels much better tomorrow. OMG - how scarry! I'm glad that Kevin is okay! I worry so much about falling/head injuries! Your fall display looks great. I need to get some hay bales myself! Wow - how scary for Kevin and your family. I hope he feels better today! Great Fall pictures Amy! I love Fall! Glad Kevin is doing okay now. How scary. Great photos Amy...I love how you celebrate Fall!